Yes, i am indeed a shopaholic, but i don't consider it to be a serious problem. I just like to shop, it's like, if i see a whole bunch of stores or a mall i get really REALLY happy. My heart smiles at the thought of buying stuff. Today was a good day for me, because i went to Queens Center Mall. 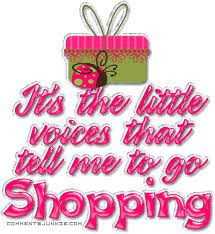 A shopaholic's favorite place to be is the mall mind you! Ahh back 2 school shopping time, my favorite time of the year. Really! I love getting stuff and what-not. On the way there i remembered that Leandra lives around woodhaven so i was wondering about her. Went to forever 21 and got my school bag. When i there with my mom, i saw this shirt and i just.....went crazy with joy. It was sooo beautiful and so...amazing, i didn't get it :( but i must go back and get it. No matter what, i will make sure i own that shirt!!!!! My Dad was lost on the way back, he kept on driving down the wrong streets, but we managed to get back to Bushwick (I doubt my dad is ever going to want to go back unless i force him). Other than that, i had a great time today with my mom, dad and my big bro. Shopping makes me smile on the inside and out xD.